From sketch characters on Saturday Night Live to movie roles such as Old School & Anchorman: The Legend of Ron Burgundy, Will Ferrell has made a name for himself as one of the funniest men in Hollywood. Another funny man who isn’t far behind (or ahead depending on who you ask) who went from stand up to movie roles in The Hangover and Due Date is Zach Galifinakis. Now the two funny men are teaming up together to go head to head into in the latest comedy political spoof called The Campaign. But does it deserve your vote? 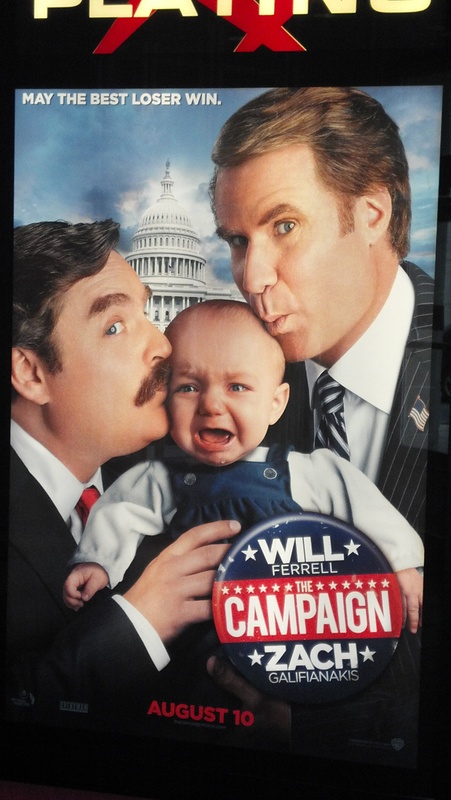 Arrogant congressman Cam Brady (Will Ferrell) has been running a campaign though he’s running unopposed. He’s quite comfortable in this position and that’s all from the assumption that he’s going to come float by another election year unopposed, despite his incompetence. However, when a company wishes to gain control of the campaign territory, they plan to be back up a candidate in hopes to make him puppet so they can accomplished their purposes. They end up choosing an eccentric yet naive tourism director Marty Huggins (Zach Galifinakis), who wishes to make a difference in his community. This race becomes a ridiculous game of escalation where one candidate hopes to one up the other in hopes of winning over the public in outlandish ways so that they could win the election. Comedy is subjective this movie is one of those “you get what you pay for” movies so I’m not going to go into details as I have done in my previous reviews. I’ll just give a brief summary of what I thought. The movie was pretty blah. Sure, it had its funny moments but unfortunately a portion of the funny moments were already seen in the trailer. Some of the funniest moments were also overdone. I liked it more not so much for the jokes but as a commentary of what the political process has become. It uses current events as a tongue in cheek joke to the antics of real life public figures. Throughout the movie, I was reminded of ways that this movie mirrors aspects of the political process. Though cheesy & somewhat hard to believe in this day & age, I liked the last act of the movie because it symbolizes what politics should really be about. One thing that I must point out is that a casting was pretty well done, particularly the casting Brian Cox in a cameo role in his relation to Zach Galifinakis.